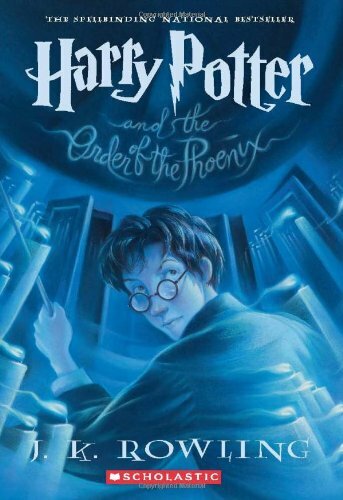 As his fifth year at Hogwarts School of Witchcraft and Wizardry approaches, 15-year-old Harry Potter is in full-blown adolescence, complete with regular outbursts of rage, a nearly debilitating crush, and the blooming of a powerful sense of rebellion. It's been yet another infuriating and boring summer with the despicable Dursleys, this time with minimal contact from our hero's non-Muggle friends from school. Harry is feeling especially edgy at the lack of news from the magic world, wondering when the freshly revived evil Lord Voldemort will strike. Returning to Hogwarts will be a relief... or will it? The fifth book in J.K. Rowling's Harry Potter series follows the darkest year yet for our young wizard, who finds himself knocked down a peg or three after the events of last year. Somehow, over the summer, gossip (usually traced back to the magic world's newspaper, the Daily Prophet) has turned Harry's tragic and heroic encounter with Voldemort at the Triwizard Tournament into an excuse to ridicule and discount the teen. Even Professor Dumbledore, headmaster of the school, has come under scrutiny by the Ministry of Magic, which refuses to officially acknowledge the terrifying truth that Voldemort is back. Enter a particularly loathsome new character: the toadlike and simpering ("hem, hem") Dolores Umbridge, senior undersecretary to the Minister of Magic, who takes over the vacant position of Defense Against Dark Arts teacher--and in no time manages to become the High Inquisitor of Hogwarts, as well. Life isn't getting any easier for Harry Potter. With an overwhelming course load as the fifth years prepare for their Ordinary Wizarding Levels examinations (O.W.Ls), devastating changes in the Gryffindor Quidditch team lineup, vivid dreams about long hallways and closed doors, and increasing pain in his lightning-shaped scar, Harry's resilience is sorely tested.